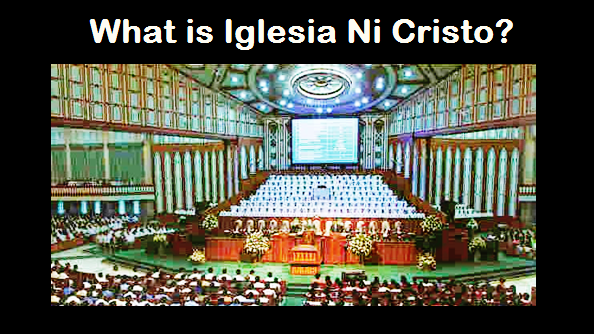 THE IGLESIA NI CRISTO: Was Mary immaculate? THE CATHOLIC CHURCH has compiled a lot of teachings on Mary, the mother of our Jesus Christ. So numerous are the titles given to her, representative of the many teachings that have been developed around her through the centuries. Thus, the rise of Mariology, the theology that deals with the presentation of the Marian theological themes. One Catholic dogma on Mary is that known as the Immaculate Conception. Many devotees believe in this dogma without even knowing what it really meant. Thus, this Catholic dogma is one of the popular Marian theological themes that has been misunderstood yet readily accepted by many without careful investigation. Others suppose that this refers to the birth of the Lord Jesus when it refers to the birth of Mary instead. That Mary was born sinless. This teaching was proclaimed a dogma of the Catholic Church on December 8, 1854, by Pius IX, in the bull, Ineffabilis Deus. WHO SAID THAT MARY WAS BORN SINLESS? (e) it goes against the expressed teachings of the Bible. We will explain these one after the other. “No direct or categorical and stringent proof of the dogma can be brought forward from Scripture…” (The Catholic Encyclopedia, s.v. “Immaculate Conception”). This is plain and simple Catholic authorized conjecture. They “feel justified in thinking that Mary’s love for God and neighbour never knew uncertainty or failure.” Well the Bible does not say so. This explains why the early theologians of the Catholic Church disagreed on the matter. In fact, they had debated on the question of whether Mary, the mother of Jesus Christ, was conceived without any stain of “original sin” for centuries. “The earliest Church Fathers regarded Mary as holy but not as absolutely sinless. Origin and some of his followers assumed that she had been imperfect like other human beings” (New Catholic Encyclopedia, s.v. “Immaculate Conception”). The absence of agreement among the early theologians of the Catholic Church and the centuries-old debates on the matter only prove that the dogma is not founded on the teachings of the Holy Scriptures. For this they had had to reply on their reasoning and imagination. The “cult of Mary” has indeed taken a long time to develop. Thus the doctrine that Mary was born sinless – the Immaculate Conception – was promulgated only in the year 1854 after centuries of fiery debate especially between the Franciscans and the Dominicans (The Story of the Church, p. 70). Let us assume that “the Virgin Mary was, in the first instance of her conception, preserved untouched by any tint of original guilt…in consideration of the merits of Christ Jesus the Saviour of mankind…” That means, the sinless nature of Mary’s Son, Jesus Christ, proceeds from His mother’s supposed sinlessness. It follows from this line of argument that for Mary to be sinless like Christ Jesus, she must have a sinless mother and for her mother to be sinless, she must have a sinless grandmother, and so on and so forth, ad infinitum, or, backwards to Eve. Is this not an absurd teaching? Thus, such dogma (Mary was born sinless) contradicts the very principle they uphold (their dogma of the “original sin”). Indeed, such reasoning of the Catholic Church defies the sharpest logical sense. Let no one be mistaken, however, that we have anything against Mary, the mother of Jesus. We only would like to protect her from the lies that surround her today and through which the Catholic Church has been gaining material wealth. The truth is, the dogma of the Immaculate Conception of Mary rests only in tradition and does not in any way rest on firm foundations, on the teachings of the Bible. To sin, therefore, is either by actively doing something against the commandment of God or by simply being passive to what God commands us to do. Thus, one can either be guilty of a sin of commission or a sin of omission. This further teaches us that no sin can be committed by anybody who has not done either the sin of commission or the sin omission. God is the Savior through our Lord Jesus Christ (cf. Jude 1:25). So, Just the same, Mary needs her Son, Jesus Christ, to save her. 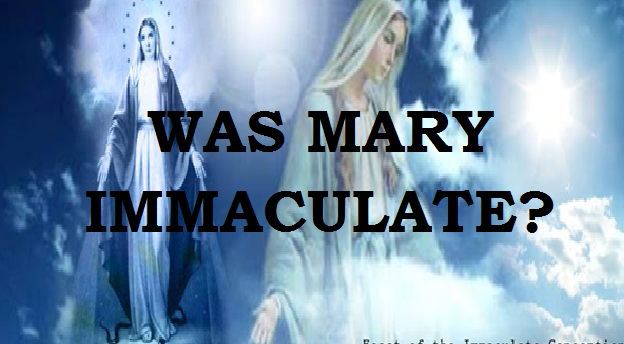 Therefore to the question, “Was Mary immaculate?” the best answer we could give is the teaching of the Holy Scriptures. The Bible says all have sinned with the exception of our Lord Jesus Christ.